Not all slate is alike and the quality can vary widely from soft and crumbly to hard and dense. Slate is usually thought of as “dreary” gray, but it comes in colors, too! You will find green, blue, black, gray, rust and multicolor of all of them, together. 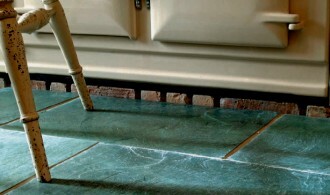 Most slate must be sealed to prevent staining. Also, any element that is acidic will cause etching (corrosion) if it comes into contact with slate tiles. Slate may not be the best choice for large flooring areas because of the the up-keep it requires.